Recently during a hike to check out the awakening green of Oak Bottom Wildlife Refuge with a few like-minded plant-lovers, our discussion turned to the subject of astringents. Stopping at a young Oak (Quercus garryana), our leader shared how a decoction of Oak bark could be used as an oral rinse for treating mouth infections and bleeding gums. He then asked if anyone could describe how astringents worked. Although I was able to give an adequate explanation of what astringents do, our leader summed up their actions quite succinctly: “dry, draw and shrink”. The word astringent is derived from the Latin word, adstringere which means “to bind fast”. Foods which are astringent cause your mouth to pucker. Imagine how your mouth feels when eating a really tart apple. So, why are astringent herbs beneficial to use? Well, the same action which causes your mouth to pucker and feel dry when eating a tart apple also helps to decrease excess secretions, control bleeding, draw out toxins, shrink and tone swollen body tissues. More simply stated, astringents absorb excess fluid, contract and constrict tissue- dry, draw and shrink. Plant-based astringents contain tannins-substances found in larger quantities in the bark but also in the leaves, buds, fruit, fruitpods and roots of most plants. Tannins help to protect plants from micro-organisms such as bacteria and fungi as well as from predators. The word tannin is derived from the old German word for oak tree-a reference to the use of tannins made from oak to process hides into leather (“tan” hides). Tannins are present in many foods including teas, coffee, wine, and most berries. Tannins help bind proteins on wounds, forming a protective coating helping the skin to heal. One of my favorite astringent plant allies is Oregon Grape (Mahonia spp). Oregon Grape contains berberine, a constituent also found in Goldenseal (Hydrastis Canadensis) and Goldenthread (Coptis chinensis) which gives the stems, bark and roots of these plants their yellow colour. Oregon Grape’s astringent properties make it a powerful anti-fungal, anti-microbial and anti-inflammatory when used both topically for skin and eye conditions as well as internally for treating conditions such as acute diarrhea. It grows quite well here in the Pacific Northwest, making it a great substitute for formulas which use endangered Goldenseal. Since ancient times, Rose (Rosa spp) has been valued not only for its incredible fragrance but for its culinary and medicinal properties, as well. Yes, those wonderfully fragrant roses are also astringent. Rosewater makes a great facial toner and can help to stop superficial bleeding from cuts and scrapes. A rose petal infusion can be helpful for acute diarrhea, sore throats and symptoms of colds and flu. Rose hips, the seed pod which appears after the rose has finished blooming and the petals have dropped off, are rich in Vitamin C and can be made into a decoction, a jam or added to soups. A word of caution here about using modern roses- almost all rose bushes sold today have been treated with fungicides which remain within the plant throughout much of its lifetime. If you want to grow roses to use in cooking or for making medicine, it may be prudent to find a nursery which sells organically-grown rose bushes. Look for heirloom varieties, avoiding some of the more fancy cultivars as these often lack fragrance. Of course, wild roses will not have these concerns, but if you wildcraft, please do so responsibly. The more I learn about herbal medicine the more respect I have for Yarrow (Achillea milleifolium). Yarrow is anti-inflammatory and anodyne (relieves pain). Topically, it disinfects superficial wounds and staunches bleeding. A hot Yarrow infusion taken for symptoms of cold or flu helps induce sweating and eliminate toxins. My mentor shared his experience with Yarrow when he had a nosebleed start while out on a hike in the woods. He wadded up a small amount of Yarrow leaf and inserted into his nostril which successfully stopped the bleeding. Please be very careful should you decide to try this. Care must be taken to avoid pushing the plant matter too far up into your nostril which could compromise your breathing. Blackberries are produced by many plants of the Rubus genus in the Rosaceae (Rose) family. Considered an invasive, thorny nuisance by some, Blackberries are high in anti-oxidants, fiber, and yes, tannins. The root has been long used in tea or tincture form to treat diarrhea, hemorrhoids and other intestinal disorders and as a gargle to relieve sore throat, inflamed gums and thrush. The berries are also astringent (and delicious!) Although blackberries seem to grow everywhere, remember to use good harvesting practices and avoid picking berries growing near roads, highways, railroad tracks or areas which have been obviously treated with herbicides (dead giveaway: a strip of bright orange foliage). Witch Hazel (Hamamelis virginiana) is a deciduous shrub found in the northeastern portion of North America. The leaves and bark were used by indigenous people to treat a variety of conditions, including external use for bruising, sore muscles, inflammation and swelling. Witch Hazel’s cooling, astringent and antiseptic properties are excellent for treating rashes, sunburn, acne, insect bites and hemorrhoids; Witch Hazel compresses can help ease the pain and congestion of varicose veins. Although some sources suggest that an infusion of the leaves is helpful for internal gastrointestinal bleeding, other sources advise against internal use due to Witch Hazel’s high tannin content. 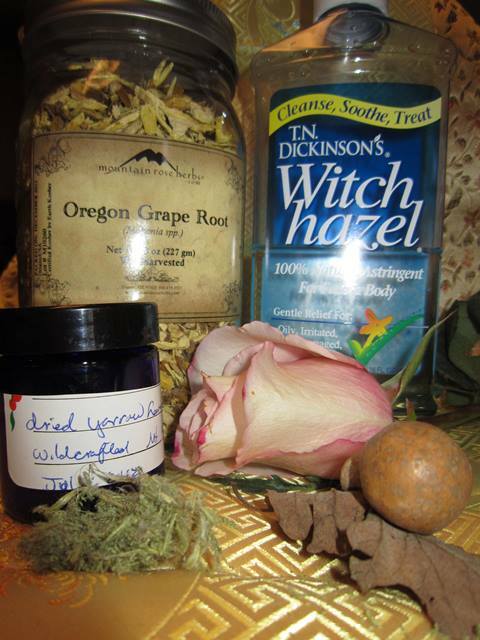 If you should decide to use Witch Hazel internally, I strongly urge you to do some research and consult an experienced herbalist first. NEVER consume commercially prepared Witch Hazel products made with isopropyl alcohol! These are for external use only and are toxic if taken internally. So, the next time you are struggling to remember the properties of your favorite astringent herbs, just remember, “dry, draw and shrink”.